Our rides evolve - keep track of yours here. Ah, he's got it covered...I'm sure there's a hacksaw or torch in every good canadian's garage. It was one of those moments........ but, stay calm and carry on, as they say. Yep, time for the hacksaw! Many a time I went to start and was thwarted by an interlock from the neutral switch, clutch or kickstand. I'm sure an adult beverage will have that fixed in a jiffy. I had been through all that when going through the diagnostics screen where you can check sidestand switch and verify Neutral, etc. The pre-flight checklist was complete, and when we turned the key, verified that again. Back a few posts ago, I had cleaned up the starter relay, refreshed all the connections.... it worked before when the PO had it, what could go wrong? I made an assumption, never actually tested it. While you might faintly hear it near the end of the video, the fuel pump cycled/ran/shut off (normal boot-up) when the starter button was pushed, the fuel pump would again run as if to feed fuel for an impending start/run. Just that the starter relay didn't go click, ergo, it's pumpin' fuel but no starter to spin the engine over. Rechecked all the fuses, Ignition, EFI and that 30 amper on the starter relay. All good. Verified juice getting to the starter relay in all the right places. No clicky. Immediate decision made, get a new relay. Ouch that OEM pricing is steep. Found a couple brand new generic ones, $10 done deal. Backup plan, found another very lightly used OEM complete with the red battery cables. $13 done deal. Both ordered, will get them on the weekend. Don't spend the $100+ on a new OEM..... it's really a very generic relay. Meanwhile, time for the hacksaw, next day, Hack and I got the old relay into the morgue for an autopsy. I could hear Cheryl Crow singing "The First Cut is the Deepest". Well, I didn't want to go too deep first go, so started cutting the plastic housing all around and broke pieces off as I went to expose the innards. I'll create a separate thread for easy searching one day and not bury it in here. Will post link here later. Wheatie, avoiding the hacksaw on the tank rod, chrome don't cut so good. OEM bolt is $10... got a new one coming from my local fastener house, fer like $5. Canajan. Waiting for a phone call, they had to order it in from another of their locations. New Flux Capacitor and Turbo Encabulator are in transit!! I'm taking a few days to work on some other pressing projects til they arrive. 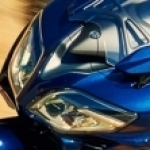 Damn, that is the quietest FJR I ever heard!! That was a kick in the pants. If that was me there would have been a few bad words before the video ended. It's that Canadian "keep calm and return fire" method. So........ Did this project progress over the weekend? I can't stop following this amazing feat taken on by our Ray. I took some time off, lots going on, parts ordered, winter weather, other projects, hockey game.... the fun will resume imminently. When the attempt to start went awry, and knowing the relay was the issue, Hack and I put power directly to the starter to confirm it wasn't part of the problem. Funny, it spun up freely, whizzing away but did not turn the engine over. 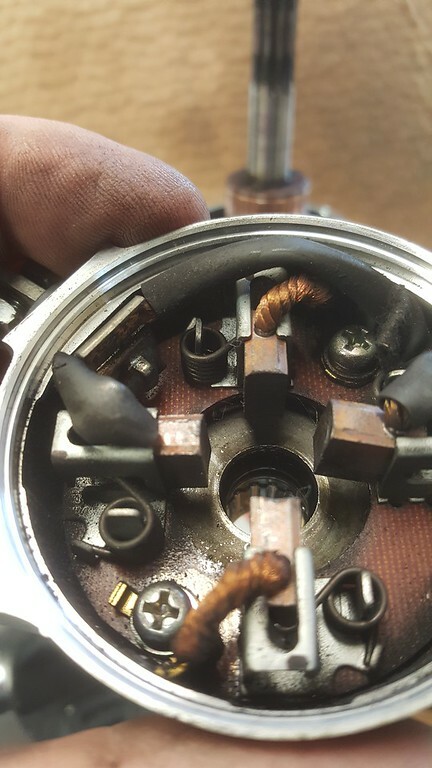 That could only mean one thing, the starter clutch was not engaging. That's a gear mechanism behind the stator that locks when the starter is pushed. Well, supposed to. When the engine starts, the starter stops (via dual Fuel Pump/Start Cut-off Relay), starter clutch stops turning because it is always engaged with the starter, lock mechanism freewheels. Well, this new engine has never been apart, so what could be wrong with the starter clutch. Answer, nothing. But guess what happens if the starter is turning the wrong direction? Yep, will freewheel the starter clutch, it will never engage. How come? Rewind to over a year ago when I first got the basket case. I had decided to inspect the innards of the starter, ensure it was clean inside, so disassembled starter, did the cleaning, reassembled. Checked the FSM for special instructions (none), simple enough. This is what it looked like with the two screws loosened, ready to take apart. Then the end cap comes off. After end cap off, pull housing off and armature comes with it. 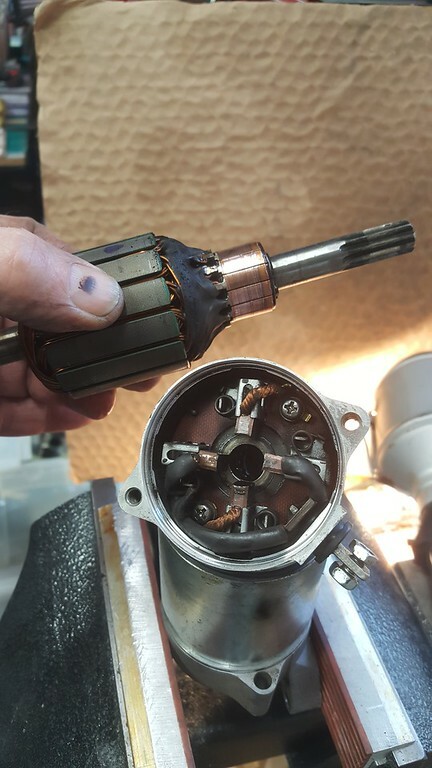 Not necessarily the recommended way, instead should hold the gear end in the vice and not the housing..... armature will stay in place in the brushes. Lesson learned, although I'd had starters apart before, just not a bike/FJR one, had only seen pictures. Learned another lesson later. The cylinder contains 4 very strong permanent magnets, so pulls out the armature with it. So it's not too dirty, no oil leaking past the end seal, in great shape. Round brownish washer is a thrust washer, and hidden underneath it is another one (no pic), only toothed and must be oriented correctly and seated... otherwise, when you put it together and snug the screws, the armature binds on the end cap, armature won't turn.. DAMHIK. 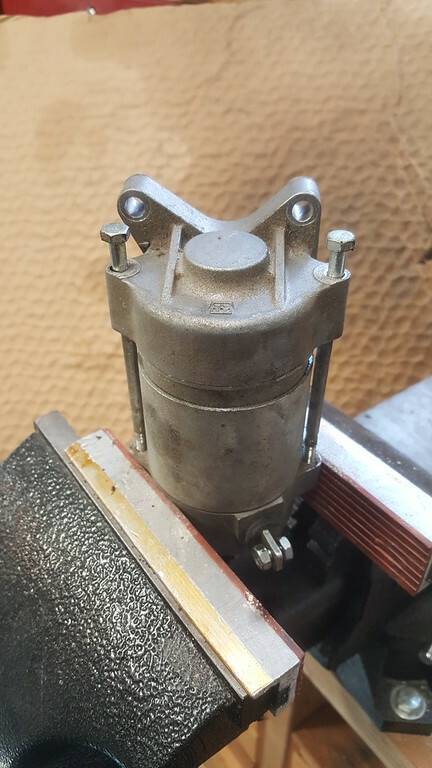 Anyway, armature/commutator was in great shape, electrically no bridges or shorts, cleaned it up, brushes too, put it all back together. So, gave it a drink of some 12 volt juice, spins nice, good to go. Installed it, throttle bodies, airbox... waited for the big Moment Of Truth day, and we know now it was actually spinning the wrong way..... so who do you call, Ghostbusters? No, send an email to your friend who knows all about FJR starters, Brother FJRay way out there in Oregon. I told him what I had done, and he 'splained the permanent magnets in the housing needed to be rotated 90 degrees, and once spinning the correct way, one can fine tune the current draw by rotating it one way or the other a degree or two. And to quote dear Ray's reply, "I'm sure you know that the first question on the trouble shooting flow chart is. "Did you touch it"". Ummm... Yep, did too! Ray had also mentioned to line up witness marks... there aren't any, so I assume he meant the bit of dirt I cleaned off. Lesson learned with these starters, make witness marks so you know the orientation. So dialed it all in, also re-read Ionbeam's post about measuring current draw , and I hooked up my Bitmeter for the first time, quite cool, thank you Alan and associated contributors. The starter is back in the bike, gave the start button a quick burst, engine spins like a top. Throttle bodies back on and airbox installed (third time, getting good at it). Air cleaner all back in, and put the newish side covers on. You know it's gonna start now. Hack will once again have the honours, and all I have to do is hook up some fuel. FJRay is always with the wise crack "didja touch it'? Did this when I rebuilt my underwater scooter. Jumped in the water, pushed the GO button, and the scooter came back and smacked me in the mask. Didn't catch many lobsters THAT day. I have met the enemy, and it is me. I don't think I understand about rotating the starter magnets 90 degrees. Wouldn't it be 180 degrees? The simplest I can say it, but more or less as I understand it..... There are 4 magnets in the cylindrical housing, or two pairs (opposite each other). They are aligned with the two pairs brushes, so when power comes in, the armature is energized becomes a magnet, repels one set of magnets, attracts the other. Position of magnets determines which way it's going to rotate. Rotating the cylinder magnets 90 degrees aligns them with the opposite set of brushes, and it spins the other way. Standard DC motor kind of stuff apparently, rotation is chosen for the desired application. I have another starter here, and checked it today. Wouldn't you know, it has exterior marks. Ok then. I was rotating in the wrong plane in my mind. 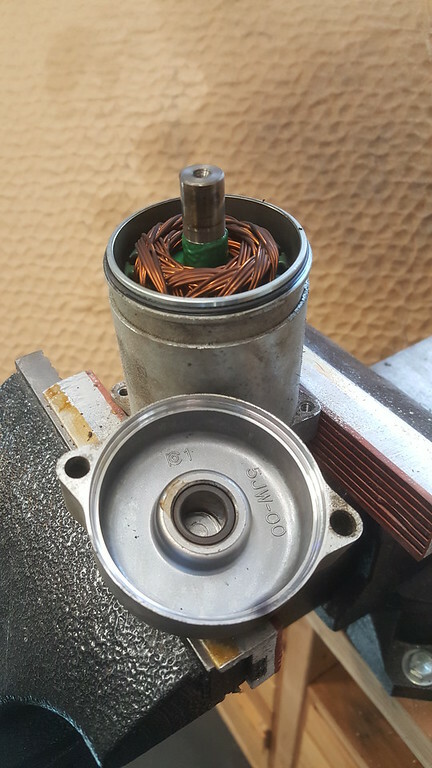 Having never removed the magnets from my dead starter, I wasn't sure. I assume there is no alignment tab to locate the magnets and that they can be rotated around the cylinder to any position. ...... and you got an in with the CBSA too, right? We'll get them held up at the border. 'Call has been made... 'Someone's going to get "randomly selected". I've got places to go and things to do in the AM Ray, but I should be back home by 13:00 if the Aussies get to be too much. While some will see a vicious guard dog, I believe you may have brought on a bunch of other problems with this picture. I'm sure a few here think you have a very nice looking sheep. Bust says, "The sheep never said NO, only yaaaaa, yaaaaaa." OK - so we had a starter issue that was self-induced, in ADDITION to a bad starter relay? Or did the self-induced starter problem fry the relay? Seems coincidental to me, JSNS. Second question: When are we going to hear the beast awake?